Let's do both and capture your lives together. So, this whole about me section, so awkward, Right? 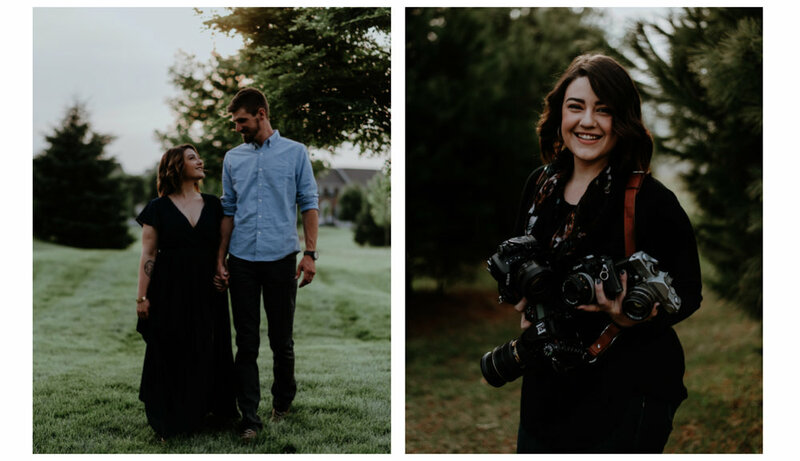 I am a wedding photographer who resides in south-central Pennsylvania, born and raised in the heart of South Carolina, who enjoys capturing any emotion one will let me take. I have a love for shooting weddings, the romance and details are completely enamoring to me. Oh. And lets not forget my dear friend, Coffee. My love for photography has been around for quite awhile now, I can even remember my first pictures at a family reunion in Iowa where, well let’s just say I was being creative, and chopping off peoples’ heads in the images. I can proudly say I’ve come far from that, ahem..creative streak and since then have worked with local musicians, brides, seniors, families, and precious little wee ones and have loved every minute. Recently my trusty sidekick, or better known as my husband, Jeff, has joined the team and has been a tremendous addition to our weddings. He's tall. We like tall. I no longer need to carry a stool tall. Note: Husband does not carry same love for coffee. Getting personal now ya'll, I'm a mother to two awesome kids, and to two lovable pups. I have a mad love for all things science, and that tends to trend towards the nerdy side of me, including everything from astronomy and black holes, to Doctor Who. I love curling up with a good book, whether fictional and re-reading Harry Potter for the 7th time, or books around quantum physics. Which leads me to how I'm definitely that person who fully intends on going out and having fun with friends, and then instead seriously commits to that Netflix binge. But most important, I feel. I feel emotions, of happiness, of sadness. Of joy and elation, and of heartbreak. I feel also, that it is important to capture these things through my lens. Being a wedding photographer has let me see many, many things, and I have been grateful for all of the points in life that my clients have trusted me with. I want to capture honest and true stories, ones of love that you can't help but smile and giggle with joy from seeing. Ones where you're so taken aback by the strength of two people together that it's hard to breathe. That is why I do what I do. And why I've come to love it so. So let's chat. Let's hang out.